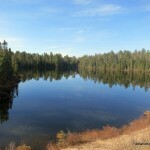 Peak 564 is a high hill in Algonquin Park and the 2nd highest point in Southern Ontario. 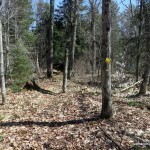 The hill is adjacent to the midpoint along the 2nd Loop of the Western Uplands Trail, near Tern Lake. 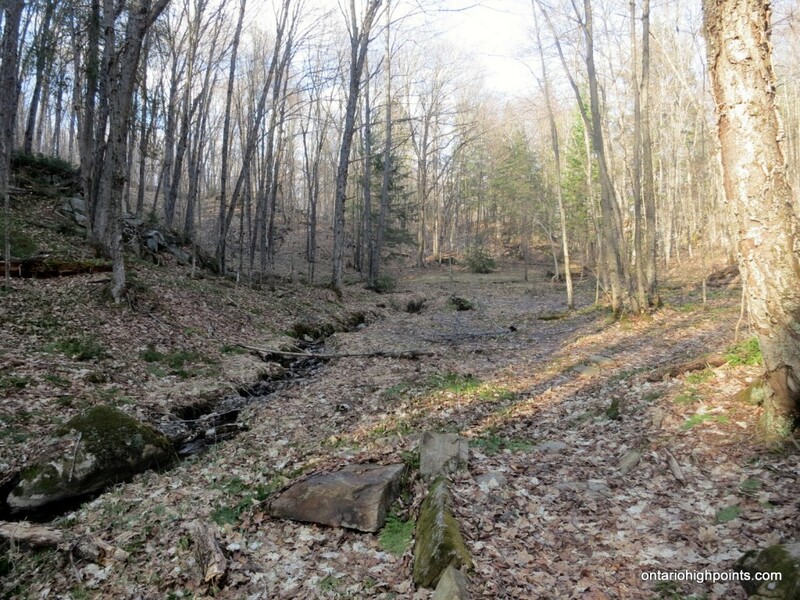 With it’s close proximity to a well established backpacking trail, it is a possible multi-day hike destination. Alternatively, one can reach the peak in a long day hike from Arowhon Road (detailed below). 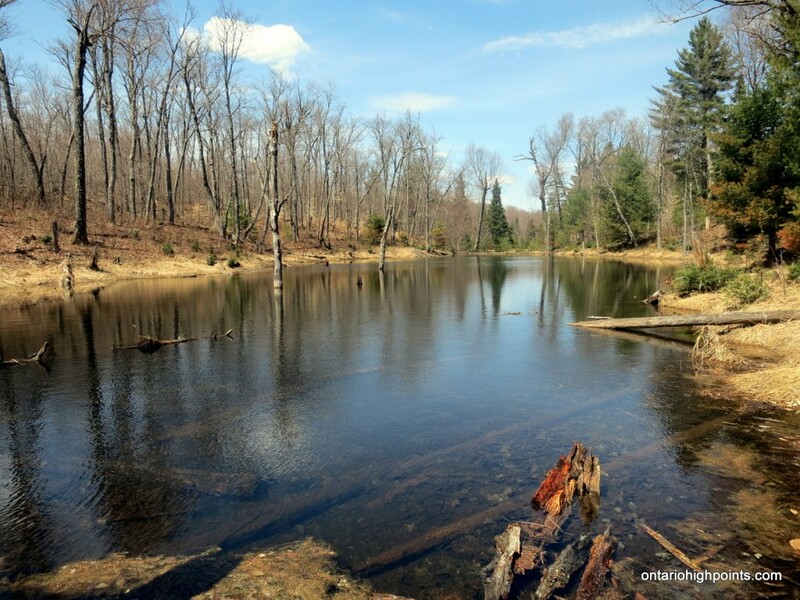 There are no views from the broad treed summit, but hikers can enjoy the vistas along many of the lakes and ponds on the approach. Make your way to the Hwy. 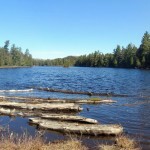 60 corridor within Algonquin Park. Obtain a Daily Vehicle Permit at one of the permit offices: East or West Gate, or Canoe Lake, etc. 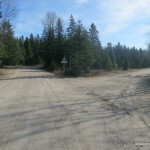 1.3 km east of Canoe Lake along Hwy 60 lies turnoff onto Arowhon Road. Make the turn and drive 4.9 km north to the ‘4 Corners’ intersection. The west road is one that you need to take, however it is limited to authorized vehicles, so you must park here and continue on foot. 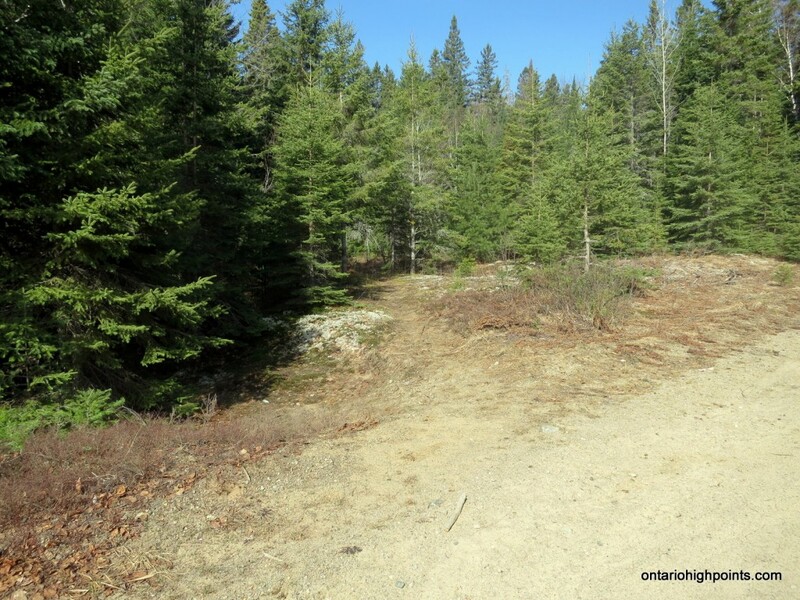 Follow the old railway bed road west for 2.3 km to the portage that leads to Maybe Pond. Follow this portage west for 1.3 km to the end. 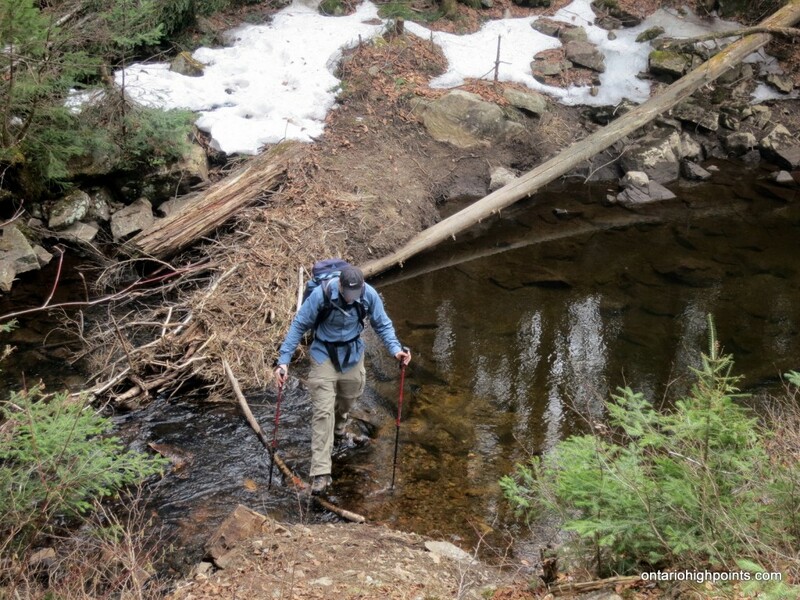 At the portage terminus, you’ll need to bushwhack the remaining 1.2 km to intersect the Western Uplands Trail. 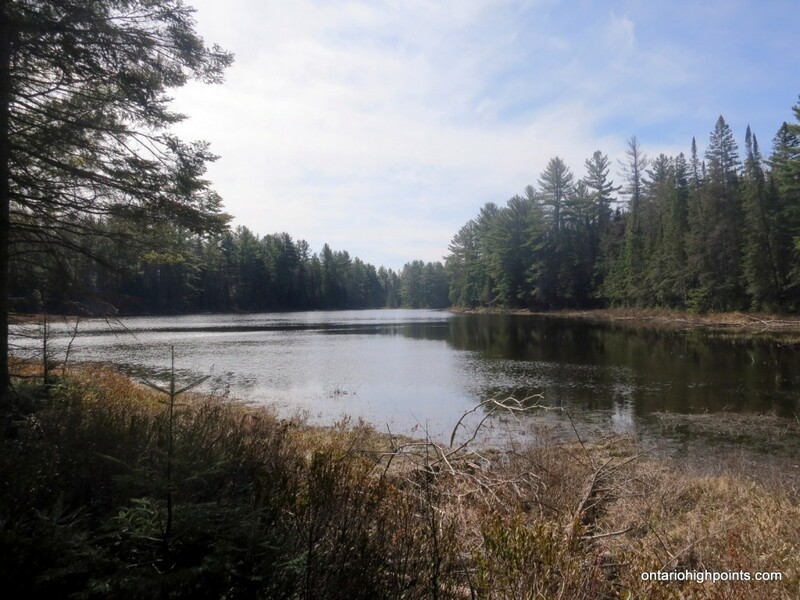 Set a 305 degree (magnetic) compass course and bushwhack through the thin underbrush of the deciduous forest until arriving at the Rainbow Lake / South Snowbird portage. 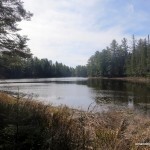 Continue on the 305 degree course bushwhack or optionally follow the portage to Rainbow Lake for some nice views. 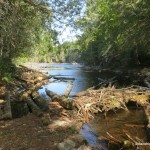 300 meters beyond the portage, you should intersect with the Western Uplands Trail. 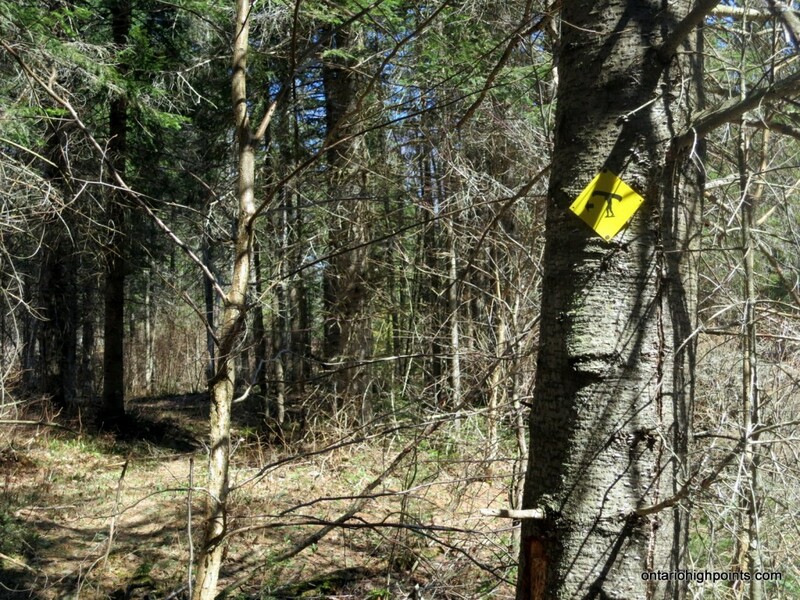 Follow the Western Uplands trail for 1.0 km to the 2nd Loop marker and then make sure to follow the 2nd Loop trail westward. 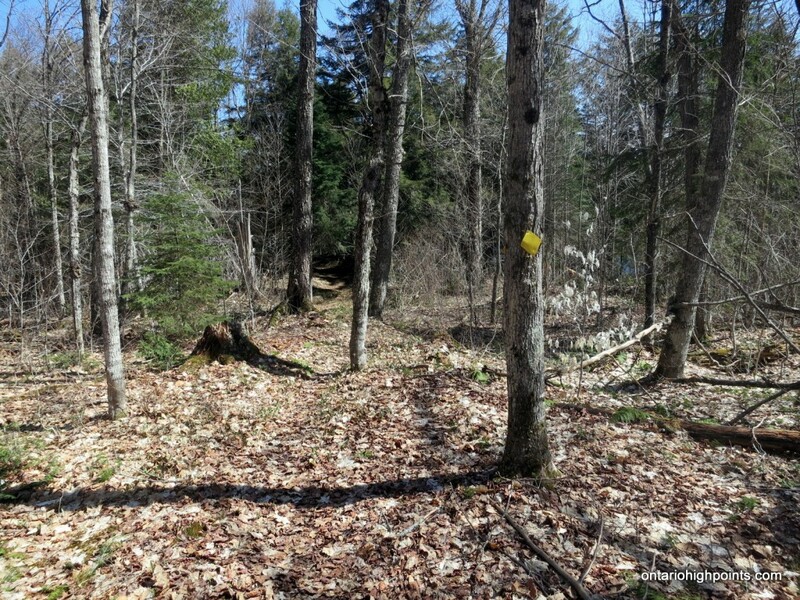 Follow the trail across several creek and wetland crossings (East River, Otterpaw Creek, Gervais Lake, etc) for another 7.1 km to just northeast of the Peak. 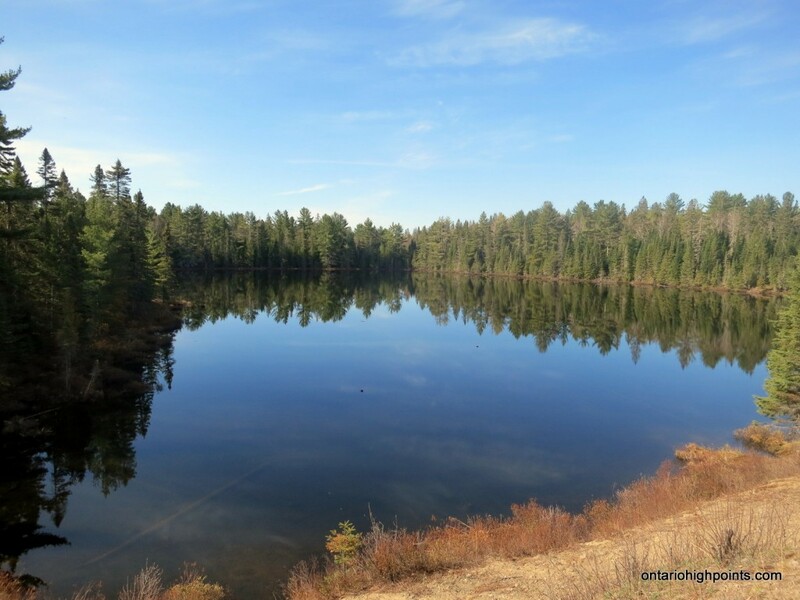 As the trail turns away from the Peak to head north to Tern Lake you’ll need to bushwhack the remaining 100m southwest through open deciduous forest to a pyramid rock formation which is the highest point on the summit. On this trip, my buddy Anthony decided to join me. 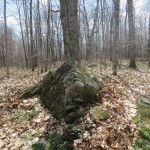 We had done extensive hiking together in the mountains of the Northeast US, but he had not experienced the adventure of hiking to an ‘obscure’ Ontario High Point. 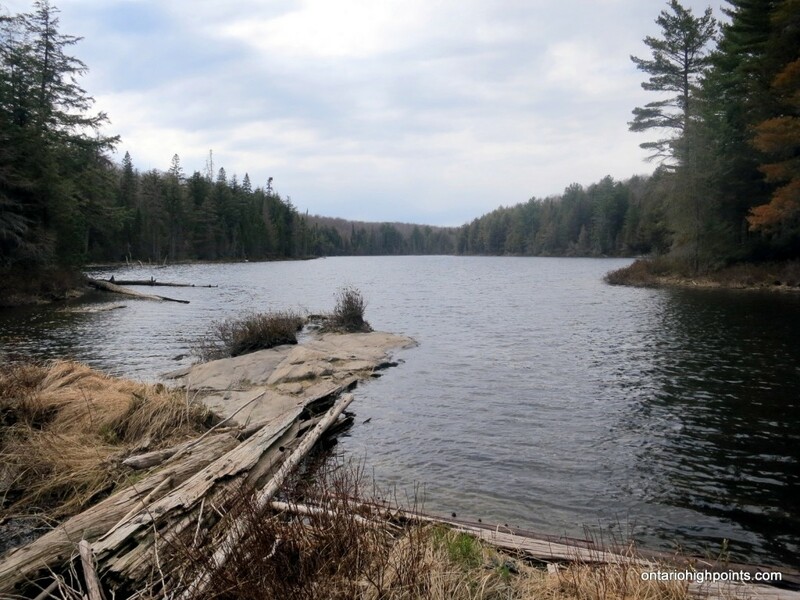 I had been religiously following the weather and ice and snow conditions in Algonquin Park but it wasn’t until a few days before the trek that the Park staff declared ice out on the lakes and the Park would be open for outdoor adventurers like ourselves. 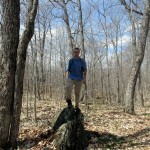 The snow/ice out conditions, ending of spring melt road closures, no bugs and a fantastic weather forecast (clear skies with temperatures in the low 20s) coalesced to a May 2nd opportunity to attempt a hike to the second highest point in southern Ontario. We set a goal to arrive at the Canoe Lake permit office in Algonquin Provincial Park for just after 8:00 AM and so according to Google Maps, we needed to depart the GTA at 5:30 AM to achieve this. We arrived at Canoe Lake a little later than our target time due to the optimism of Google Maps and a few stops along the drive north. After some confusion finding the permit office building, we got our Daily Vehicle Permit. We jumped back in the car and drove a bit further east along Hwy. 60 to the turnoff onto Arowhon Road. 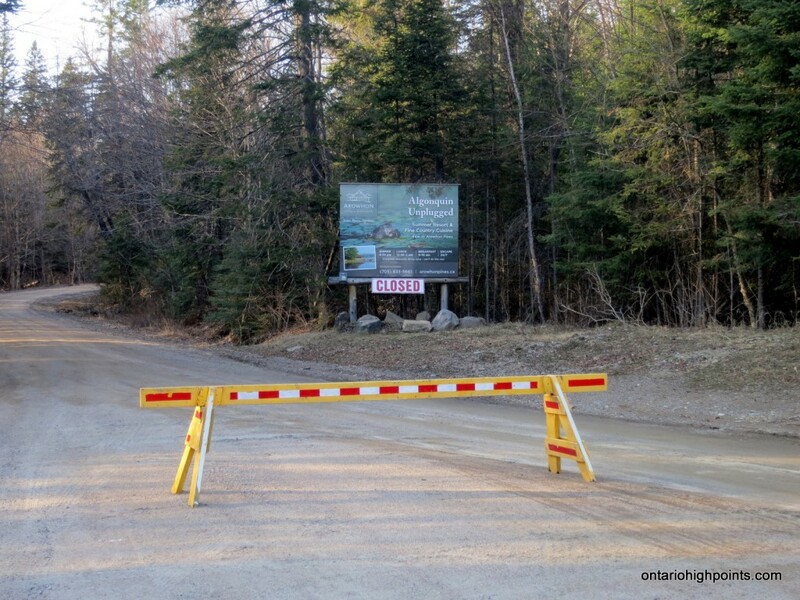 We were surprised to see ‘Road Closed’ signage as the Friends of Algonquin Park website had indicated that the road was now open. 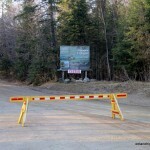 We decided to go back and talk to the park staff at the permit office about this, so we drove back to Canoe Lake. The park staff person said that the road was closed beyond the ‘4 Corners’ due to the spring melt, but we could drive the road to this point. My plan was to park at the ‘4 Corners’ anyhow, so this worked for us. Arowhon Road was in pretty good condition and we had no trouble with the 4.9 km drive to the 4 Corners. I parked the car and as we suited up, we were greeted by a pair of grey jays looking for a handout. 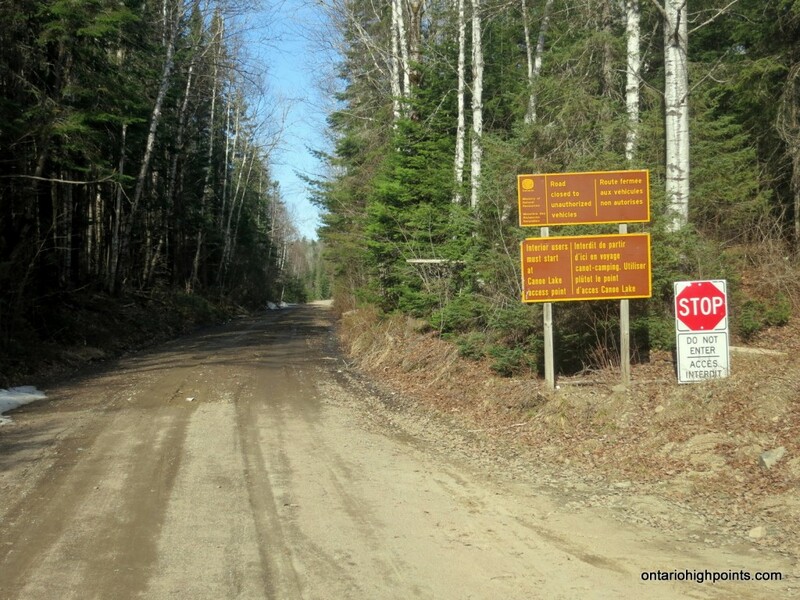 We started off our hike travelling west along a road which followed an old railway bed and immediately passed a ‘no unauthorized vehicles’ sign. 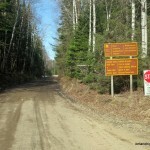 We followed the road beyond the sign and crossed the southern tip of Joe Lake atop a fairly high railway embankment. 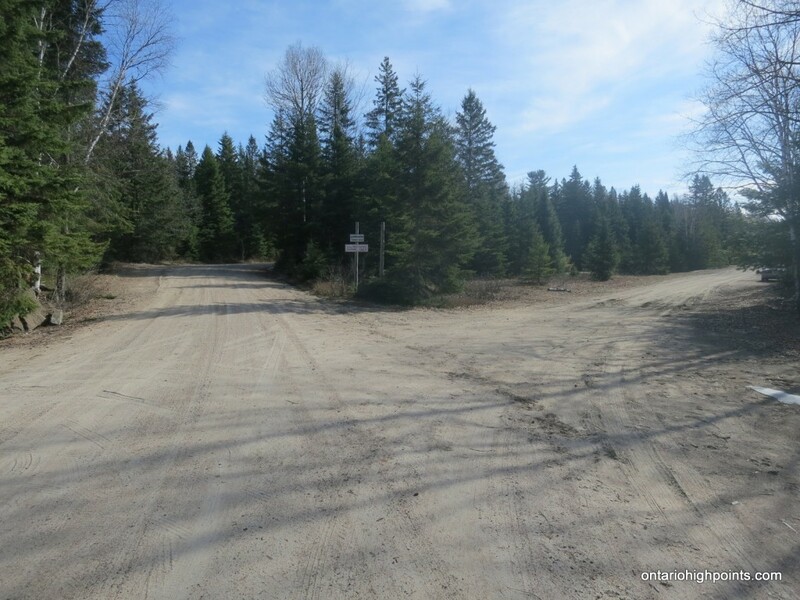 After arriving at a 3-way intersection, we left the road and joined a portage heading west towards Maybe Pond. 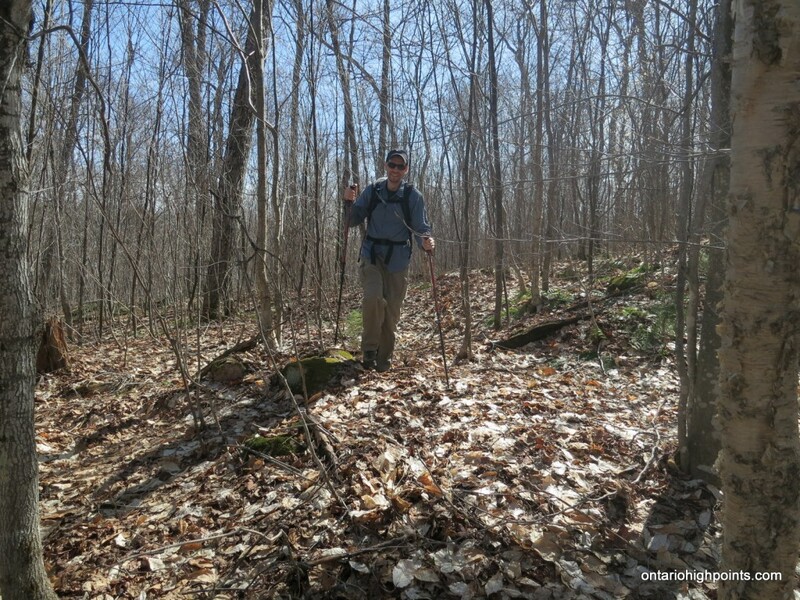 The untrampled leaves underfoot gave me the impression that the portage had not seen recent use, so we had to stay alert for markings and other trail clues in order to stay on the correct path. 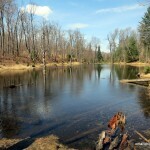 After a short hike we arrived at the edge of Maybe Pond. 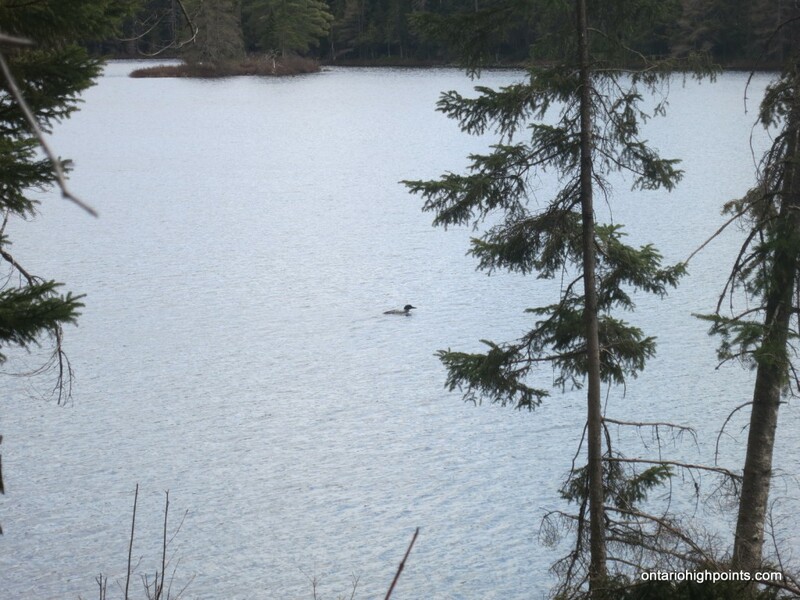 We stopped for a break here, beside the creek at the mouth of the pond under the shade of a cluster of cedar trees. 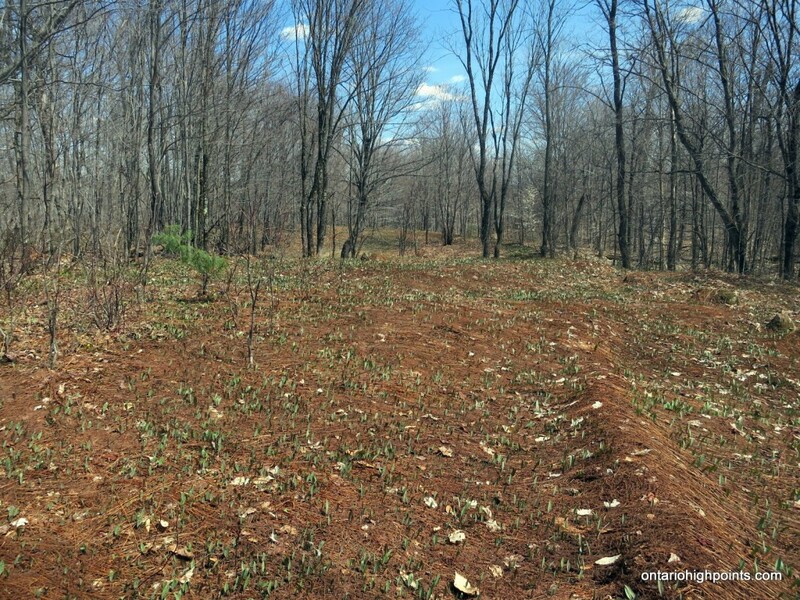 When it became time to continue on our hike, I reconfigured myself for bushwhacking mode, set a compass course and dove head on into the Algonquin woodlands. 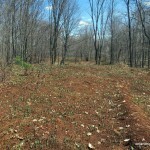 Since the forest was still leafless and the underbrush was generally thin, there was very little ‘whacking’ to be done. 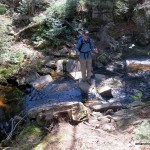 We made descent progress to a portage which intersected our bushwhack course. 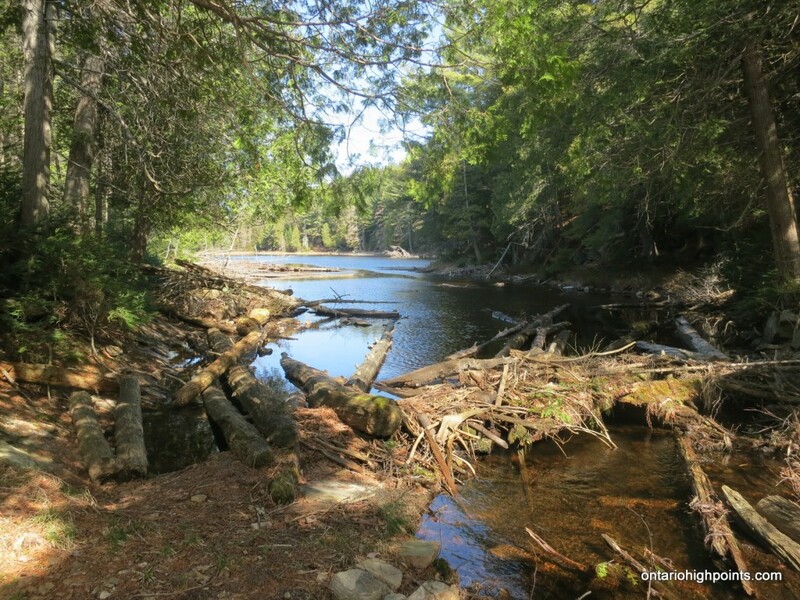 We decided to investigate the terminus of the portage at Rainbow Lake and got some nice photos of the west arm of the lake. 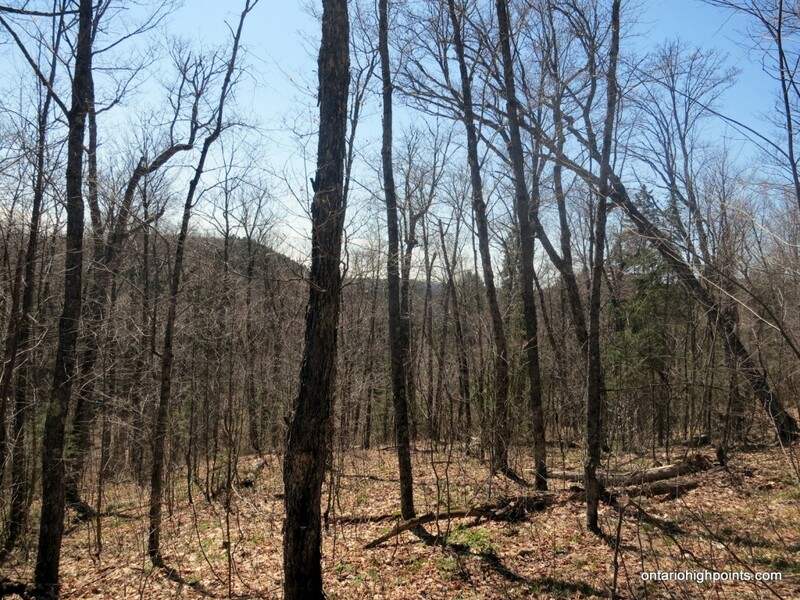 We continued on with the bushwhack and a short time later intercepted the Western Uplands Trail, which would lead us to Peak 564. 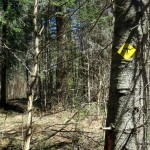 The Western Uplands trail was fairly well marked, and except for a few instances we were able to follow the trail without too many mixups. 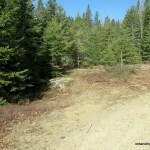 We navigated some confusing side trails at the Rainbow Lake camp area and soon arrived at the 2nd Loop 3-way intersection. 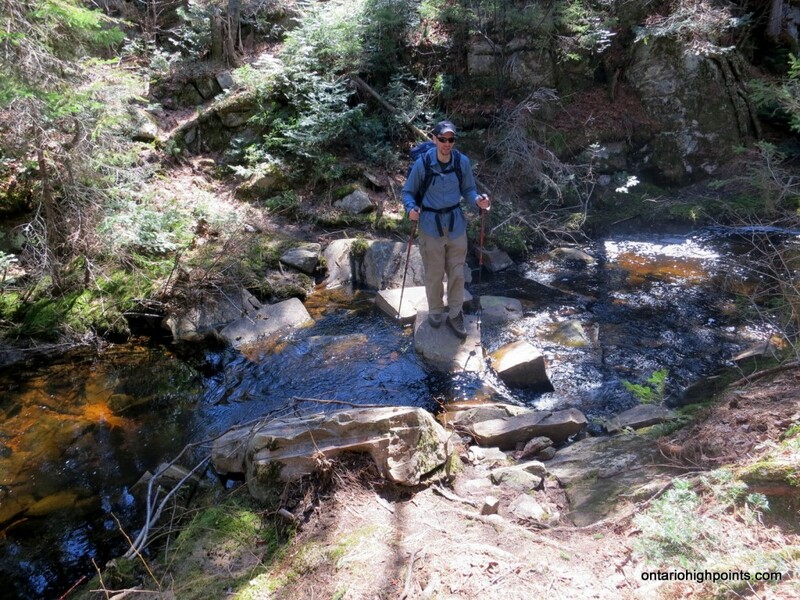 Selecting the 2nd Loop we continued westward and crossed a few creeks, including Otterpaw Creek. 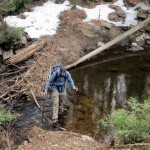 Crossing Otterpaw didn’t present and difficulties, however the trail seemed to disintegrate on the west shore. 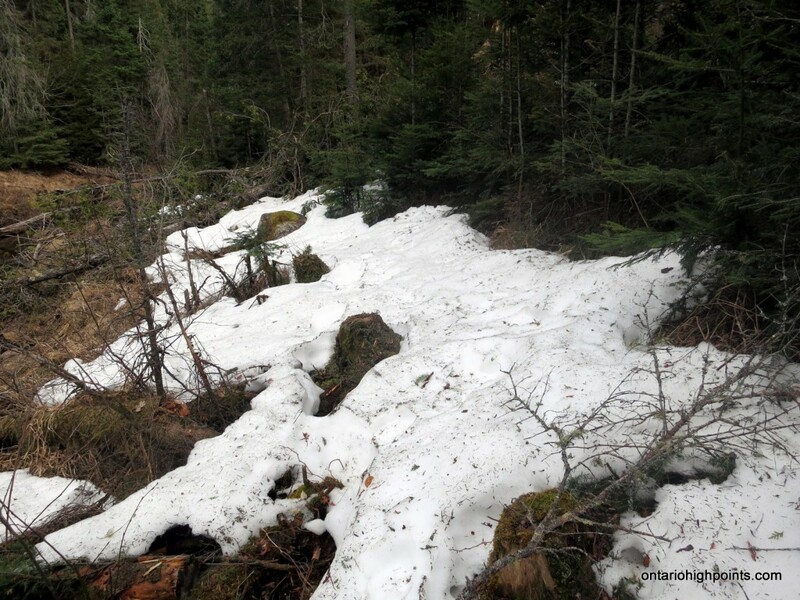 We followed some footprints through some thick snow which was still lingering along the creek bank, but after dodging some fallen trees and heading up a hill we had still not seen the trail. 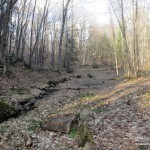 I reacquainted myself with the trail map and noticed that the trail hugged the bank of the creek for some distance. 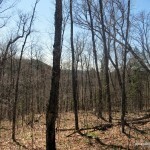 We crashed back down the hillside through the trees and bushes and rediscovered the trail. 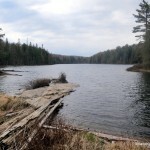 We passed a couple of lakes: West Otterpaw Lake and Gervais Lake and a couple of unnamed ponds along our final section of the trail. Just before reaching the summit, the trail turned north, so we departed the trail and hiked the remaining 100 meters through the open forest to the top. 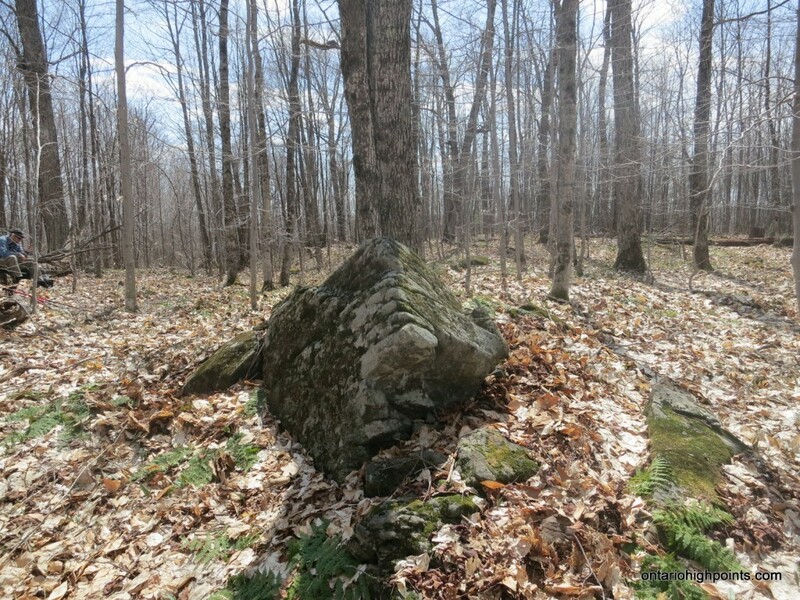 Unfortunately the hill was fairly broad and the few large boulders, rock formations and ridges made it difficult to determine the absolute highest point. 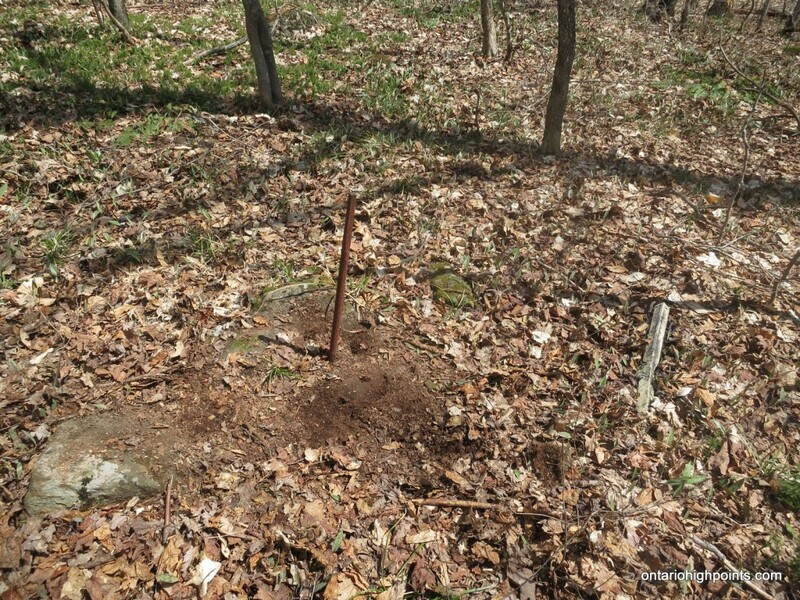 We first marched to the coordinates of a spot height as indicated on my topographic maps, but this spot height was in the middle of a small muddy swamp, definitely not the highest point. 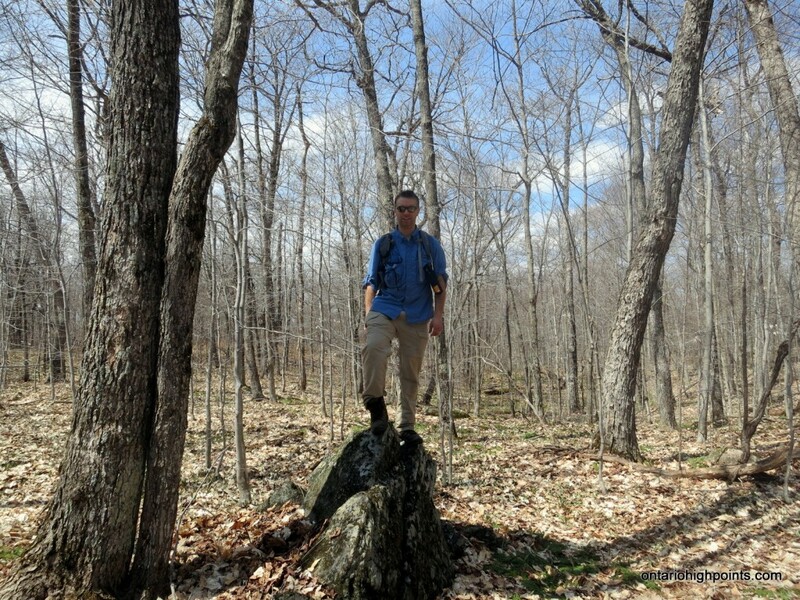 I continued my exploration and after visiting several candidate high points, I decided that the highest point appeared to be a pyramid shaped rock formation. 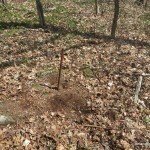 After some snacks and refreshments, I followed up with some more exploration and found some metal bar debris and a small metal spike stuck in the ground just a few meters from the high point. We had arrived at the summit at 2:00 PM. Our journey had taken us 4.5 hours over a distance of 13.2 km. With this knowledge, we knew we still had a long day ahead of us, as we still had the return trip. 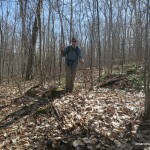 We suited up and headed off the hill, intersected the Western Uplands Trail and followed it east. 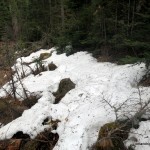 The return trip was fairly uneventful, as we were able to anticipate and correct for the few confusing trail anomalies. 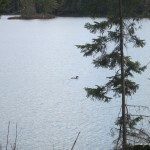 We arrived back at my car at Arowhon Road in 4 hours, arriving at 6:30 PM – a long day of hiking. We drove into Huntsville for some supper and then headed to the GTA, arriving home at about 10 PM.